Test Your Intuition (34): Tiling high dimensional spaces with two-dimensional tiles. A tile is a finite subset of . We can ask if can or cannot be partitioned into copies of . If can be partitioned into copies of we say that tiles . Here is a simpe example. Let consists of 24 points of the 5 by 5 planar grid minus the center point. cannot tile . Test your intuition: Does tiles for some ? 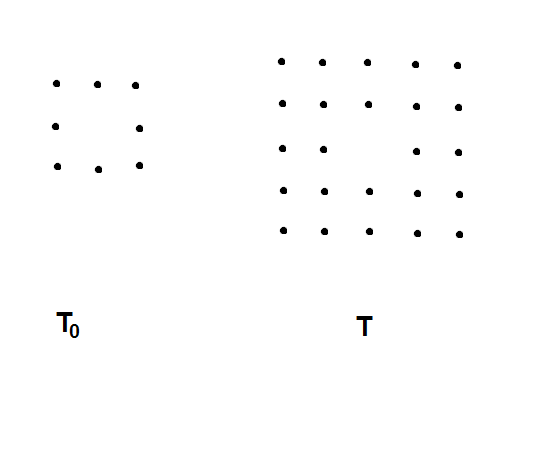 If you prefer you can think about the simpler case of consisting of eight points: the 3 by 3 grid minus the center. This entry was posted in Combinatorics, Test your intuition and tagged Test your intuition. Bookmark the permalink. 7 Responses to Test Your Intuition (34): Tiling high dimensional spaces with two-dimensional tiles. I’d like to have some hints on how T_0 can tile Z^3.